Lt. Pratt of the O.P.D. is shown here wearing his gold badge. In 1916 he patented the "Pratt Combination Cuff" which was very successful and is highly sought after by restraint collectors. The combo on the left was his first patent and the one on the right his second. Oakland Police badge #424 with the added Retired panel. Sterling silver. 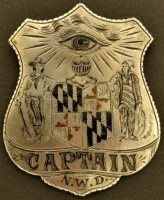 Oakland Park Police Badge XVII circa 1910. 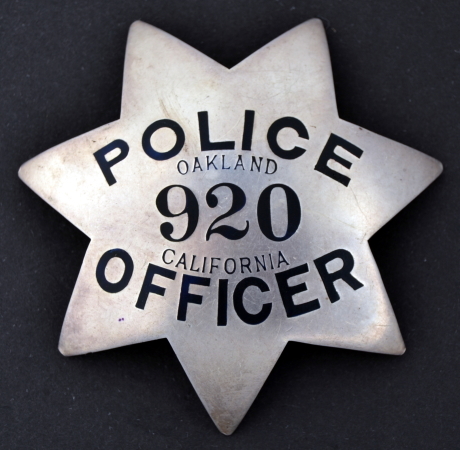 Oakland Police badge #920. Sterling silver. 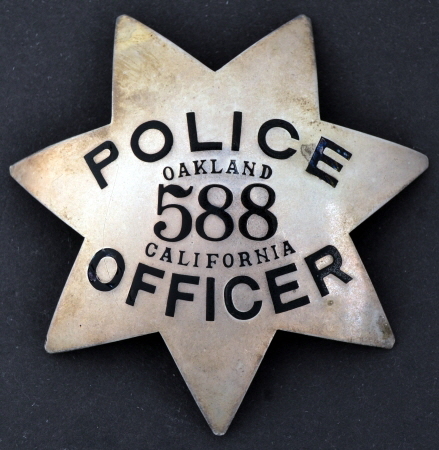 Oakland Police badge #588. Sterling silver. Oakland Police badge #700. Sterling silver. Oakland Police Special Officer City Hall, obverse is stamped Ger. Silver and hallmarked 906 Broadway, circa 1910. 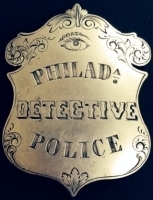 Oakland Police badge #396 issued to G. D. Skelton on March 1, 1927. Sterling silver. 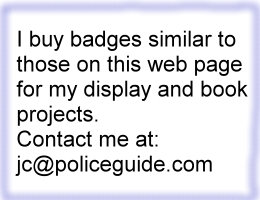 Oakland Police badge #581. Sterling silver.